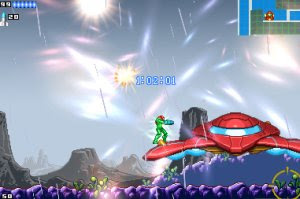 This is Metroid: Bounty! I confess, it has no real plot yet, but what it lacks in plot, it MORE than makes up for with a very robust engine and unique gameplay! I hope you'll enjoy my 3 years of hard, hard work. A detailed map system for locating your location. Unique, upgradeable beam weapons that stack on top of each other.